John Lennon & Yoko Ono original signed bed-in drawing. 20 ¼ by 25 ¾ in. Estimate: $70,000-$90,000. BEVERLY HILLS, CA.- Julien's Auctions, the world's premiere entertainment and celebrity auction house will once again make history when the doors open for a star studded auction that includes items from the worlds of Rock n Roll, Sports, the Royal family and political memorabilia on Thursday, December 1, 2011 through Sunday, December 4, 2011 at the Julien's Auctions gallery in Beverly Hills. Julien's will highlight the rock n roll portion of the auction event with a very rare offering of items from the Fame Monster herself, Lady Gaga. The award winning multi-platinum music icon's unmatched style can be seen on stage, in print, on billboards and at Julien's gallery. Her famous structured dress worn for the cover of Madame Figaro magazine in 2001 will be offered for auction. The now famous costume designed by and is estimated to sell for $10,000 - $20,000. Additionally the prop gun used in Lady Gaga's music video for Born This Way, will also be offered with an estimate of $6,000-$8,000. When you hear the words rock royalty, any collector knows it must mean The Beatles, The Rolling Stones or U2 amongst others. Included are stage worn outfits from the Beatles that have been on display at the Rock, n Roll Hall of Fame and Museum. These include John Lennon's stage worn collarless suit by D.A. Millings; George Harrison's A Hard Days Night D.A. Millings suit and Paul McCartney's D.A. Millings jacket from Help! Ringo Starr's jacket worn on stage at Harrison's Concert for Bangladesh and on the television program George Martins With A Little Help From My Friends will also be offered. 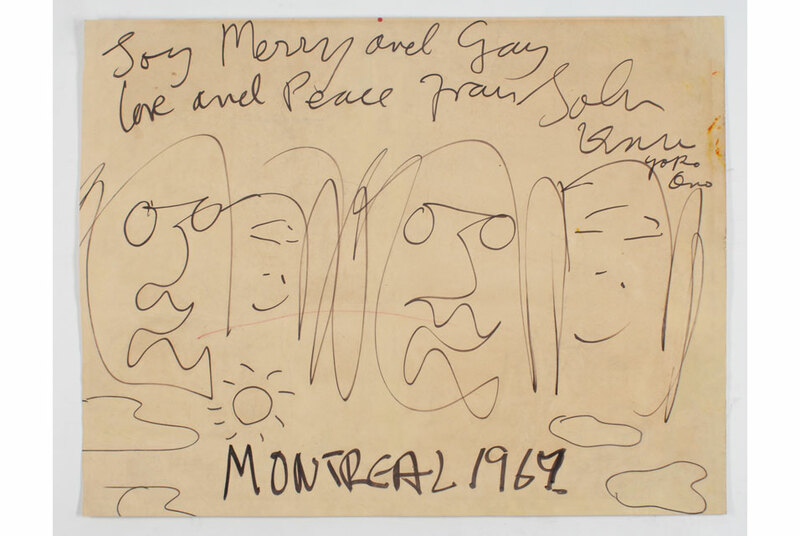 Along with the other highly anticipated Beatles memorabilia will be an original caricature of Lennon and Yoko Ono drawn by Lennon himself from his bed during the infamous Bed In to promote world peace in 1969. Lennon had gifted this caricature to Norman Seaman. Also offered will be a complete set of Bag One Lithos. The original drawings were given to Yoko Ono as a wedding present and deemed obscene by Scotland Yard. (The Bed In Drawing est. $50,000-70,000; Bag One Lithos $1,000-2,000). The Irish Falcon Gretsch guitar in evergreen, from U2's Bono's personal collection with a scratch guard that read The Goal is Soul and signed by the legendary lead singer of the world's most famous rock band of our time will come to the auction block. Bono also signed the guitar. The very rare offering is estimated to bring $80,000-$100,000. .the one and only Muhammad Ali. A portion of all Ali related items proceeds will benefit the Muhammad Ali Museum and The Muhammad Ali Parkinson's Foundation. You can Float Like A Butterfly and Sting Like a Bee and be known as The Greatest so it is not surprising that Muhammad Ali won the 1977 Victor Award for his performance in the 1976 fight against Ken Norton. This trophy up for auction comes from the collection of Veronica Porche, Ali's former wife (est. $8,000-$10,000). Other Muhammad Ali highlights include a number of personal and signed items belonging to Ali himself. Among those is his 1980 training robe with stitched letters across the back which read Muhammad Ali (est. $7,000-$8,000). The sports memorabilia portion of the four day auction event will be a championship in itself. Highlights include a 1920 Dempsey gifted jeweled pocket watch to friend, senator and fight time-keeper, Bill Cyclone Lyons. The inscription on the 14k gold watch reads, To a true friend my pal Sen. Bill Lyons, from WM. Harrison Jack Dempsey, Heavyweight Champion of the World, Christmas 1920. This lot is accompanied by a vintage photograph of Dempsey presenting the watch to Lyons. (est. $10,000-$12,000).